Tony and Matt Hirschman spent time racing against each other as well, since Matt started a limited schedule of Modified Tour racing as the driver of the Ed Bennett-owned #59 car this season. 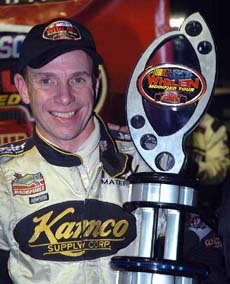 He had several strong runs to compliment the championship that he won in the Race of Championships Modifieds in 2005. That’s right, two Hirschman and two championships. But Matt is much more in awe of his father’s five titles. The #48 Troyer-chassised Modified that Tony Hirschman drives on the NASCAR Whelen Modified Tour has proven itself to be a pretty good little racecar. In a time when the majority of top touring series teams bring a back-up car to the racetrack every week, Hirschman won his second consecutive championship, and fifth of his career, without a back-up at the track, shop or anywhere else. Hirschman cruised along to slay the giants. He finished the race in the 12th-postion, good enough to claim the championship by 18 points. The battle against Christopher’s #13 team was personal for Hirschman. It’s just been Hirschman, a team of volunteers, a simple trailer towed behind a large SUV, that one racecar and a whole lot of heart. That is what took this year to win the Tour championship. 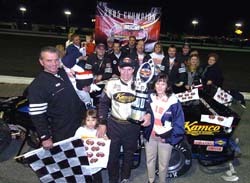 Hirschman went up against Ted Christopher’s Mystique Motorsports team this season for the title. By comparison, the black cars that TC runs are always waxed up and covered with chrome. They have the best of everything that is needed to go fast. 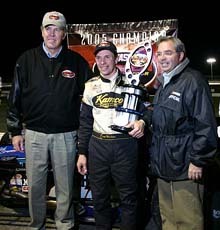 Christopher and Hirschman battled all year with TC winning seven races and Hirschman settling for five victories. It was a tight battle that ended when Christopher made contact with another car and hit the wall on lap 10 of Sunday’s season finale at Thompson Speedway (CT). After winning last year’s championship, Hirschman intended to build a second car. But that didn’t happen. The car hasn’t been the only constant for Hirschman. His #48 team, owned by the Kehley family from Brooklyn, New York and centered around Hirschman, his two sons Matt and Tony, Jr. and Frank Gasper, is a secret weapon of hard-working underdogs who overachieve. Hirschman might get paid, but he’s not really a full-time crew member either. He’s busy during much of the day running Hirschman Garage and Speed, which is a Troyer dealer in Pennsylvania. The chance for father and son to share the track this year has been something that both men have valued. “It’s really been neat,” said Tony Hirschman, who was quick to point out that Matt was still very active with the #48 team. “He knew what we were up against today and he’s a big part of this team. He does set-ups and works on this car. Sunday’s 12th-place finish wasn’t spectacular for Hirschman, but it was what he needed to do. He led early, but gave up the lead to pit. Instead of rocketing through the pack after his stop, Hirschman played it safe as cars wrecked around him. Less than 20 of the 32 cars that started the race finished it and a DNF would have likely handed the title to Christopher. 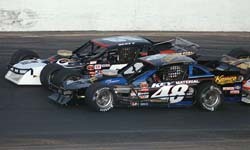 “We were leading the race when we deciding on pitting,” said Tony Hirschman. “It would have been tough to go the whole way on the tires. We knew that we couldn’t do it and everyone needed to pit. I figured that we could go 125 laps, but the track wasn’t there. We pitted when we did while leading. Maybe we should have waited a little bit more. I was playing it safe. Luckily, we dodged a bullet. Looking at the big picture is what makes a five-time champion. Next up for Hirschman will be the banquet circuit, including a trip to the December NASCAR Nextel Cup banquet week in New York, where NASCAR wines and dines their touring titlists like royalty. Hirschman is a quiet guy and a simple man, but he’s certainly not above one week in the limelight.